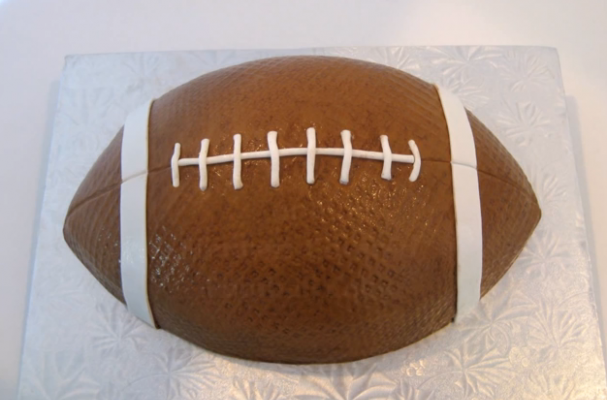 If you are looking for s show stopper at your Super Bowl party, this football cake might just be it. Cake decorating is no easy task and those bakers who choose to go the extra distance are rewarded with not only a delicious dessert but something their guests will be talking about for the years to come. There are essentially three steps to creating this cake. First, and the most obvious, you will have to bake the cake. You can choose any flavored cake for this recipe but I have included the ingredient list for a fabulous French vanilla sour cream cake. Next comes the buttercream. This is the frosting layer between the cake and the fondant. Lastly, the fondant is the final touch to any professionally decorated cake. You can learn how to work with fondant in the video below. 1 lbs. (2 cups) shortening (Sweetex if possible--Crisco will work.) Sweetex is a high-ratio shortening. For full recipe instructions, visit the website or watch the video.